Since May of 2011 our instruments have been designed and engineered to connect directly to a 207 bar/ 3000 psi cylinder. If you bought your instrument prior to this date the instrument was designed for a US Standard Nitrogen Cylinder. This cylinder is normally delivered with 2500 PSI / 173 Bar pressure or less. You should never need a regulator when operating with either system inside the USA using standard 173 bar service. Since May of 2011 our instruments have been designed and engineered to connect directly to a 207 bar / 3000 psi cylinder. This change was made largely to eliminate the need for a Pressure Regulator. For instruments purchased prior to May of 2011 being used outside of the United States, you should consult your local gas supply (nitrogen) store. Check the local requirements for the use and standards of high pressure gas. A regulator will be needed if the tank pressure is greater than 173 Bar/ 2500 PSI. Our instruments come with a 6-Foot Filling Hose fitted with a CGA-580 Nitrogen connection (standard for USA) at the end of the hose. Every country has different requirements and possibly different fittings. You may need to buy an adaptor or change the nitrogen fitting for service in your area. We might carry your local fitting in stock. Please contact us directly to check if we carry your nitrogen fitting. We supply two types of regulators. The first is a High Pressure Regulator with a Supply Pressure of 200 Bar and Delivery Pressure of 0-100 Bar. 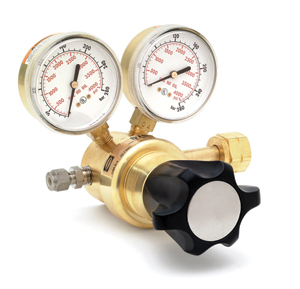 This type of regulator is designed to be connected directly to your local gas tank (pressure no higher than 200 Bar) and then connected directly to the instrument. The regulator allows you to adjust the pressure to the operating pressure of the Pressure Chamber. We will install a quick-connect and 6- Foot Hose to connect to the instrument direct. The second type of High Pressure Regulator we carry has a Supply Pressure of 200 Bar and Delivery Pressure of 0-173 Bar. This type of regulator is designed to connect to your local tank and trans-fill into one of our Portable Tanks or the internal tank of the Model 610 or Model 615. This regulator is only used during the trans-filling of the tank.